TerraTrike is excited to offer the Rambler with our Electric Vehicle Option (or “E.V.O.”, for short). This trike will transform the way you ride and will increase your range by degrees of magnitude. It will allow you to climb hills that were previously daunting, and it will keep you spinning through rolling terrain. The Rambler E.V.O. is not intended to be an electric trike. The E.V.O. was designed to help you along your journey, while you still get the cardio benefits of trike riding. You will hear and feel the motor turning on and off as it senses your need for assistance. You will still be shifting the trike as you normally would; as the hills get steeper, or as you come to a stop. The Rambler E.V.O. motor is pre-programmed so no user set-up is needed. We figured out the ideal torque sensor setting and assist level so that it is very predictable and optimized for assistance and range. The top speed is governed at 20 mph. Can the program be changed from stock? The answer is yes, and there are accessory options that you can get exclusively from your authorized TerraTrike dealer to change the way the motor behaves. The Rambler E.V.O. motor control accessories available are ‘Wired Plus Minus (WPM)’, ‘Wired Console’, and ‘Wireless Console with Plus Minus’. 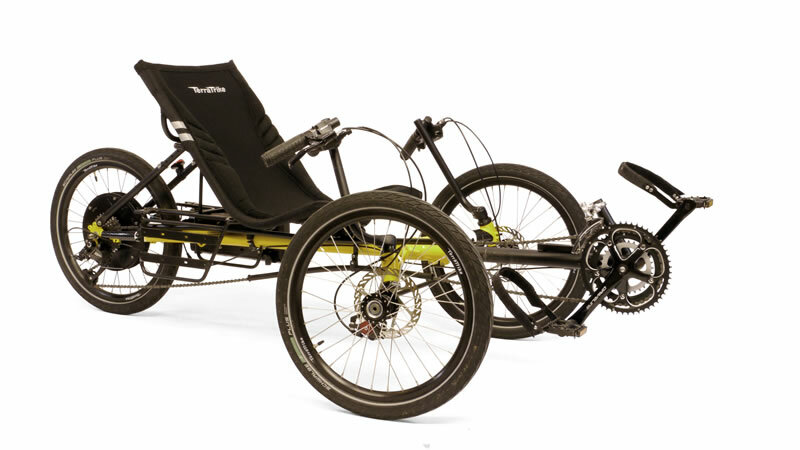 The trike will still be limited to 20mph, but you will be able to adjust the level of assist (low, medium or high) or you can put it into one of three regenerative modes which actually charges the battery on long descents. The optional Wired Plus Minus (WPM) switch also adds a reverse gear. With the WPM accessory, you simply push and hold down the minus button and after a couple of seconds the trike starts to back up. You will need to back pedal while it is backing up due to the drivetrain of the trike. But don’t worry... max speed in reverse is 2 mph. The WPM accessory can also help with starting from a stop (if you are on a hill or forgot to downshift) by providing a “crawl” feature. Just as you pushed and held the minus button to crawl backward for reverse gear, you push and hold the plus button to go forward. It too is limited to 2 mph, and is merely intended to get the trike rolling so that you can begin your pedal stroke. After the trike starts to move, and you start to pedal, you can let go of the plus button and the motor assist will kick in as appropriate.